Today, the first in our eight-part series on fragrance related holiday gifts. We're starting off late (we usually start on Black Friday, but lateness is one of my personal themes for 2016) and we're starting off (relatively) cheap, with stocking stuffers and cheap thrills. Do add any of your own recommendations in the comments! 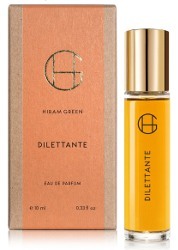 From Hiram Green, Dilettante in 10 ml Eau de Parfum: "Aglow with the gentle buzz of a luscious garden after a daytime rain shower, Dilettante, the latest all-natural scent from Hiram Green, is a delightfully playful tribute to the innocent joys of summer." $45 at Luckyscent. 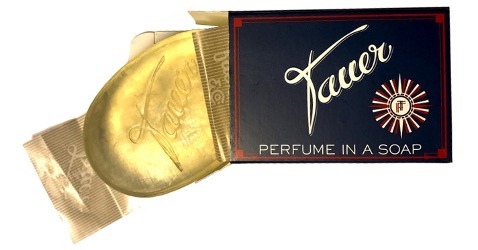 From Tauer Perfumes, Majestic Tuberose soap: "A rich perfume blooming in pure vegan glycerin soap. Majestic tuberose is an amazing luxurious scent, playing with white flowers, softened by natural rose absolute and jasmine absolute. The perfume blooms wonderfully in soap and will fill any room with the seductive perfume of a basket of white flowers." 100 gr bar for $15 at Fumerie. 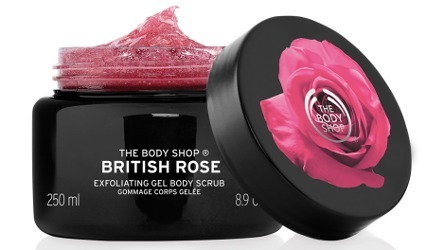 From The Body Shop, British Rose Exfoliating Gel Body Scrub: "Fresh, light exfoliating gel texture infused with rose petals. Polish, refine, and smooth skin with our British Rose Exfoliating Gel Body Scrub that boosts your natural glow." $24 at The Body Shop USA, but watch for sales — you can get it cheaper!! 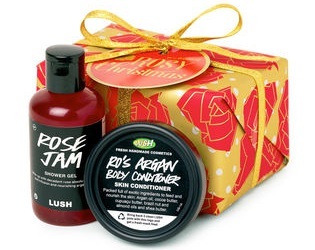 From Lush USA, the Rosy Christmas gift, with a 100 ml Rose Jam Shower Gel and a small pot of Ro's Argan Body Conditioner. $18.95. 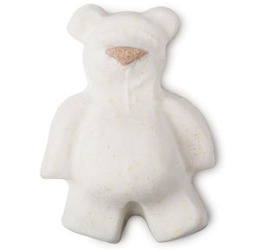 And also from Lush, a perfumista-worthy stocking stuffer — the Butterbear Bath Bomb: "Molded into a friendly bear, this bath bomb has a generous helping of cocoa butter to give you the softest bear hug imaginable. It's great for nourishing and protecting skin, no matter how long you stay in the tub, and has the same vanilla fragrance as our Butterball Bath Bomb." $4.95 each. 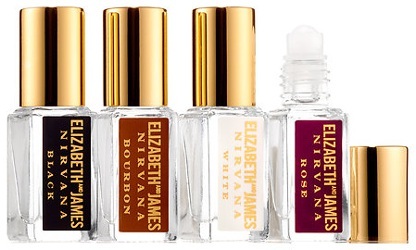 From Elizabeth and James, the Find Your Nirvana gift set, with four 3 ml rollerballs (Nirvana Black, Nirvana White, Nirvana Rose and Nirvana Bourbon). $28 at Sephora. 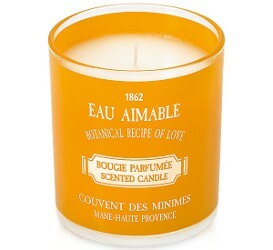 From Le Couvent des Minimes, a candle in the Eau Aimable fragrance: "The softness of orange blossom: a fruity and floral fragrance with a delicious, sparkling scent that conjures up sweet childhood memories." $18. 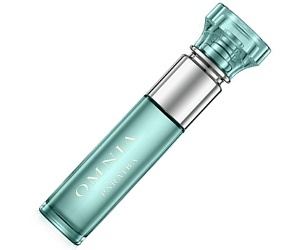 From Bvlgari, Omnia Paraiba in a 10 ml travel spray: "A colored gemstone that is a tribute to Brazilian femininity, where joy and beauty is a state of mind. A fresh and luscious floral-fruity scent that is inspired by the scents, colors and flavors of Brazil." $25 at Ulta. 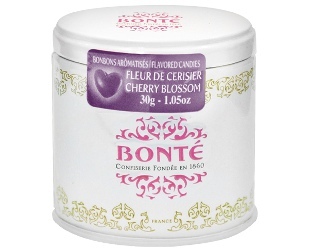 From Confiserie Bonté, cherry blossom candies: "Hailing from western France, Confiserie Bonte is a fine confectionery manufacturer that specializes in old fashioned sweets (still partly made by hand!). Bonte (French for ''goodness'') products make ideal gifts for candy connoisseurs, gourmets with a sweet tooth, and anyone that appreciates delightful sweet treat." $5 for a 30 g tin at Smallflower. From Maria Candida Gentile, a 15 ml bottle of Hanbury Eau de Parfum: "Inspired by visits to the Giardini Botanici Hanbury in Ventimiglia Imperia, Italy, a city located on the Northern Sea of Italy. Lady Dorothy Hanbury, entertained many notables of her day including Winston Churchill who loved to come every year in spring when the flowers were in full bloom." $45 at Indiescents. 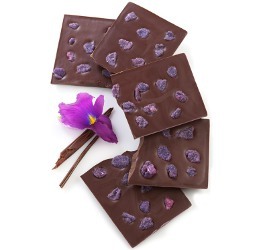 From Sucré, the Candied Violet Chocolate Bar: "...this rich and delicious chocolate bar is layered with perfectly candied violet petals, making this a chocolate bar that is not only scrumptious but a visual masterpiece as well." 65% dark chocolate, $8 each. Yeah, I only eat dark chocolate, that violet bar looks yummy! Well, as you know, lateness is one of the personal themes of my entire life, so you are forgiven. Craving that perfect sized Dilettante! I have definitely come over to your side this year! It’s actually rare that I want every single thing on a gift post, but today, really, I’d be happy to have ANY of those. But at the top of the list, the Dilettante and the Hanbury and the Tauer soap. The Tauer soap bar is the perfect gift for a dear friend, who works like a donkey and never treats herself to a perfume or body product unless I buy it for her! This, combined with the rose/jasmine/neroli oil I plan on making as gifts,, will be perfect! Oh, that sounds like a perfect & very thoughtful gift. The soap comes in Mandarine Ambree too, if that helps, but sounds like the tuberose might be a better fit. Yes, great gift idea! I wish I were on the receiving end ???? One of these days I am gonna make my rose/jasmine/neroli oil in larger batches and sell it on Etsy and at a booth at Saturday market. It’s basically a dupe for the luxury Rodin oil, and I am amazed at the price per bottle for the stuff. Same for the Kahine Body serum- I have made the dupe for that and can sell it at a 1/4 of the price and still make a profit. Wanting all of it, but especially the Dilettante, Nirvana set, English Rose scrub, and the chocolate! The day I started doing up this post, the TBS rose gel scrub was only $12, so it is worth keeping an eye on! The Nirvana set is also very tempting. I am not sure if those are EdP or Perfume Oil, but was assuming they were oil. I bought a FB of the oil and was very disappointed because 6 months later, all I could smell was the carrier oil. I ended up tossing it out. Maybe I got a bad batch, but I have stayed away from that line ever since. I wonder if it was a silicone based “dry oil”? I’ve had terrible luck with those, they always seem to lose their scent. I never buy them now. Hoping I can find TBS scrub at TJ Maxx or Marshall’s, along with some Queen of Hearts (inspired by last Friday’s poll!). According to Sephora’s website, the Nirvana roll-ons are EdP and not oil. And they had the Bourbon one as a 100 point reward last week – I snapped that right up. Love the Hiram Green smaller travel size! And in every HG scent. Already emailed the link to spouse, taking NO chances! This post is going straight to Santa’s inbox. Hopefully his inbox is not too bogged down. Not bargains in this price range, but Luckyscent has the most beautiful and luxurious discovery sets and sample kits now, including boxes of 6 mini-Amouage EdPs, By Kilian travel sprays with three different scents, MFK, Xerjoff, HdP, and more. It’s a way to enjoy a luxury brand for less than the cost of one bottle. I got the British Rose Body Scrub when it first came out. It is very nicely scented and gently exfoliating. Oh, I had that Sucré bar last time I was in New Orleans (a few years ago!). It was fine but honestly I could have eaten just a bowl of the violets. The chocolate can be overwhelming. I want that Tauer soap and the Dilletante spray. I might have to bend Santa’s ear…. Well, that’s my wish list done and dusted, and I didn’t have to lift a finger. Thank you, Robin. Oh those Nirvana scents, each is great in its own way. So which one? or two or three? or all four?! Yes, please, and 3 mls counts as a sample, right? I am not ashamed to admit that for a month I have been huffing the empty box that held a bar of Eau Aimable soap. The soap is long gone but the box still smells fabulous. I guess I was waiting for that candle to come along. Perfect. Of course it counts as a sample! I already bought one of the items on this list. My 13-year-old grandniece is getting the Lush Rosy Christmas gift. That violet chocolate looks yummy. I don’t think I’ve come across that brand before. I’m also feeling tempted by that Hiram Green. That’s about the perfect size. I found a Sucre bar in a small Italian gourmet store in a relatively small town near me — so they can’t be all that rare! Eek I want everything on this post. Would end up on Santa’s naughty list if I got them all though haha! -saving list!